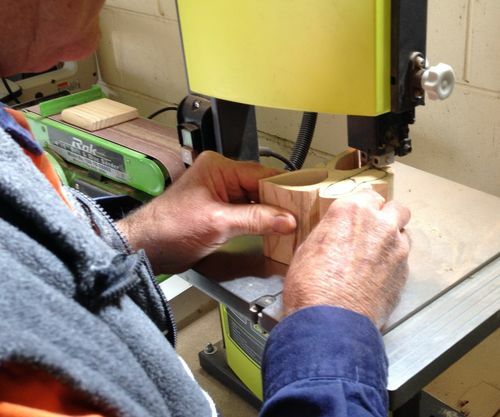 I am finding that Men in Sheds is not all about the chance for older people to learn something new to occupy their time but a meeting place to drink coffee and chat or should I say B… S… and try and out do each other. and to get away from the wife. I suggested that females should be invited but was put down by a majority. 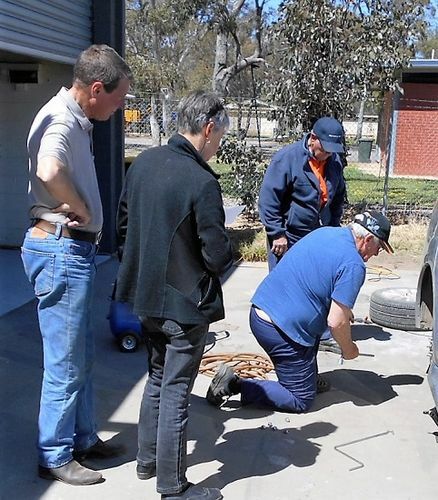 all their life driven tractors, trucks and heavy machinery that they should respect the lathe, band saw, scroll saw etc and wear safety goggles and dust masks when using these machines. The two that do use safety equipment are the 2 bikies. When I said earlier that in the USA some of these guys would be classed as hillbillies, well there are members whose family name is CLAMPETT (but no Jed). The official opening was on the 22nd October and members of the local council promised the world to these men but that will remain to be seen. 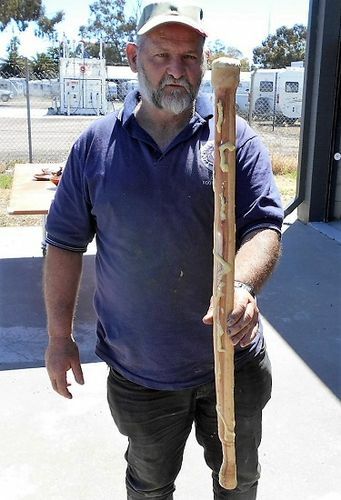 he had used a scroll saw at school over 50 years ago and took some convincing that he should try something easier. Rob on the band saw. Victor is camera shy. I am rather enjoying being the guru but really think teaching children would be much easier. I was asked why didn’t I wear dust mask when showing them to use the machinery. Replied that it was because it would make it hard to tell them what I was doing. They swallowed that lot. The bikies don’t want to be photographed for obvious reasons but they are a pair of genuine blokes. Last photo is of some of the Clampett family working on a car at the shed. Our next session will be simple cutting “bowls from a board”. I have supplied some of my old projects that have been taking up space in my shed for the members to sell with money going towards the club, turned over $230 dollars in sales and they then suggested I should at least get 50% of sales to cover costs. Works out well. Thanks for the update, Bob. I like your sign much better! That looks to be a great place to hang out and work if you don’t have a personal shop. I like to attend if I could!! This is a great thing to be involved with and to be in good company. I agree with Jim, I would help out if I was there. Looks like a well equipped shop. Sounds like you’re being patient, and that’s a good approach. I have to echo the comments from Jim and Dave. This is a great project to have in your community. Wish there was something like that in my area. Looking forward to seeing some of the projects. 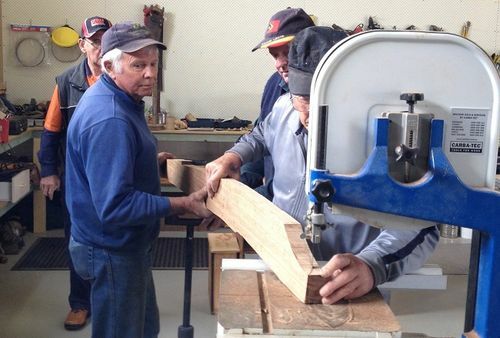 Got to love a well organized and run Mens Shed, especially one with purpose…. Great photos and great story line Bob. 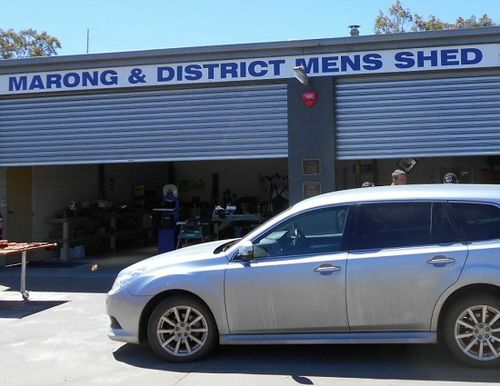 I am sure the Blokes in the shed will enjoy being in the shop. Particularly when they begin producing things. OH!! !, now where have I heard all that before Bob. 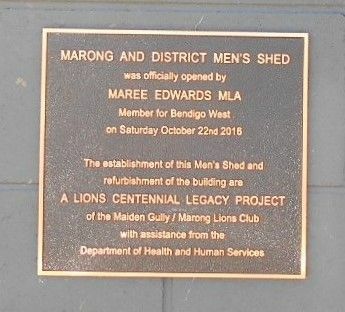 I know, the Kalbarri Men’s Shed. We have guys who want to use the lathe but are S* scared, others that are Over safety Conscious, or cleaning freaks, and cannot stand a piece of dust on the bench or floor. Man, are they going to be in for a shock when the Lathes start. I’ll have to post some of our photos sometime. You’re doing a good job and I’m about to share your woodturning teaching with our guys. This looks like a real blast Bob, boy like a lot of the other guys I’d love to be able to join in with you.